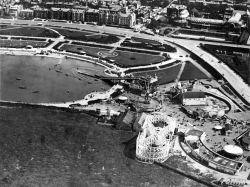 Above: An aerial view of White City taken in 1920. The Figure-8 is approximately in the same spot as today’s Pinfari Wild Cat. Above: The station entrance to the Figure Eight Railway was operated by Helters Limited until the end of the 1936 season. The company, partly controlled by Blackpool Pleasure Beach, replaced the ride in 1937, when Charles Paige’s Cyclone roller coaster opened on Good Friday 1937. 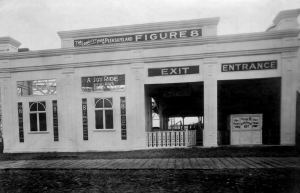 The claim that the Figure Eight was the longest ride on Pleasureland, and frequently advertised as “Nearly a Mile in Length” in the Southport guidebooks of the time, was one of the many quaint exaggerations of the day. Above: The civic ceremonial opening of Pleasureland in 1922, as the mayoral party savour the pleasures of the Whip. 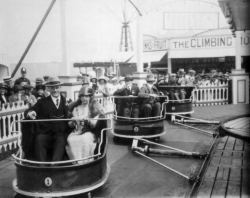 "Pleasureland Memories is a BRILLIANT book - I would personally thoroughly recommend it...If, like me, you enjoy amusement park history, the pictures in this book will leave you yearning for - and smiling at - the simpler more carefree times of days gone by. Nice one Joyland!" "At last a publication that really looks into the history of one of England's best loved amusement parks. Covering the early development of amusements in the seaside town of Southport, the book faithfully brings to life the highs and lows and growth of Pleasureland. Many never before seen photos accompany the detailed text, a must purchase for anyone interested in UK amusement history." "In this new, extremely well-designed book, the author, a freelance teacher with a lifelong connection with the town, relates the history of Pleasureland....The book is comprehensively illustrated and should appeal to anyone interested in the wider aspects of the amusement business." "Southport remains an interesting park, and its history is well worth reading." 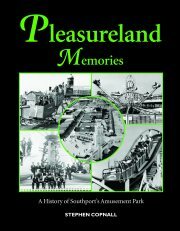 "Having worked at Southport Pleasureland for a number of years, albeit for Silcock's rather than Helter's or Thompson's, I found this book to be of great interest. Of course there are some claims of ride ownership and dates of events which I could query but overall I think the author has done a marvellous job."